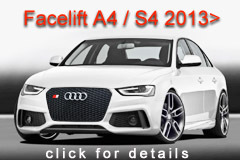 2 Audi facelift S4 body kit styling packages now available - click either for details! LLTeK supplies German product for German cars. 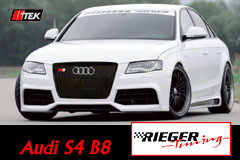 LLTeK has been importing and providing body kit styling and tuning options for Audi enthusiats since 1996. 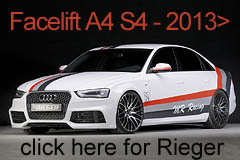 Euro manufacturers Rieger and Caractere have played a major role ensuring that the bumpers, sideskirts, and spoilers, provide the quality design, material and fitment Audi S4 owners demand. 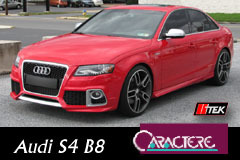 This original thumbnail of the Nogaro Blue S4 B5 (with a 2.7T mill in it) can be enlarged with a pop-up: it's one of the first LLTeK cars modified from way back and featured split-lip bumper spoilers, some carbon look B pillars, and a trunk spoiler that would do well in a gathering like Waterfest. The picture is from the LLtek website some 14 years ago. Heh. The two pre-facelift Audi S4 B8's (2007in the column to the left feature contemporary styling direct from Europe and offer distinct options for owners of the Audi S4. 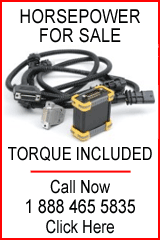 You can speak with an LLTeK rep who owns an S4 with a supercharged V6T in it and ask questions about the tuning and performance parts we offer.